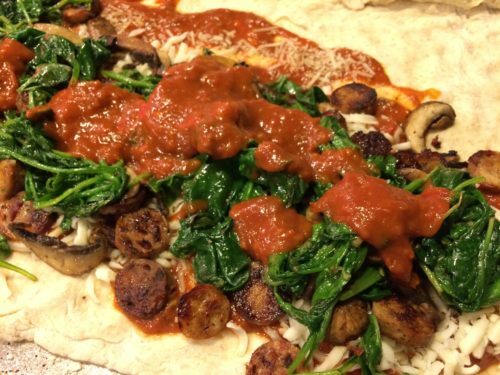 Sausage Spinach Mushroom Calzone. 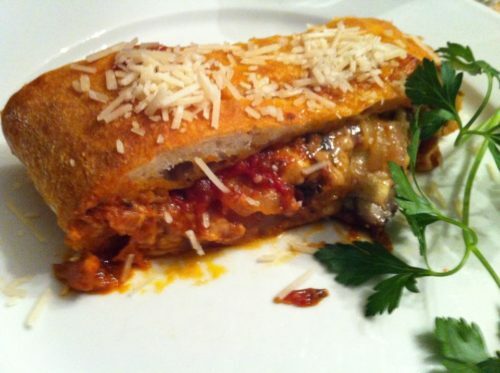 When I was in college in Pennsylvania, a popular Friday night dish was the stromboli. Strombolis were on practically every pizza shop‘s menu throughout Pennsylvania. Sometimes you could find calzones but it was rare. So what’s the difference between a calzone and a stromboli? 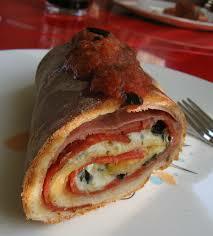 A stromboli is a rectangular pizza dough that’s loaded with toppings as filling and then rolled up, baked, and sliced. 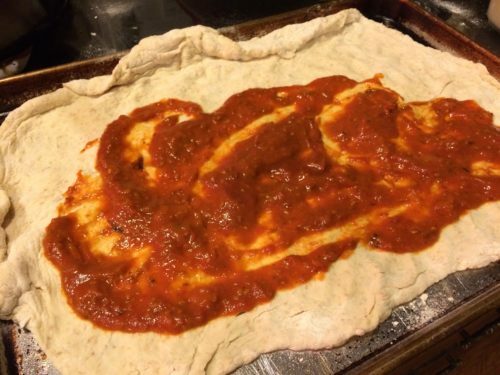 The traditional stromboli usually doesn’t include pizza sauce as a filling ingredient. A calzone is a round pizza dough that’s loaded with toppings including tomato sauce and then folded in half, baked, and sliced. 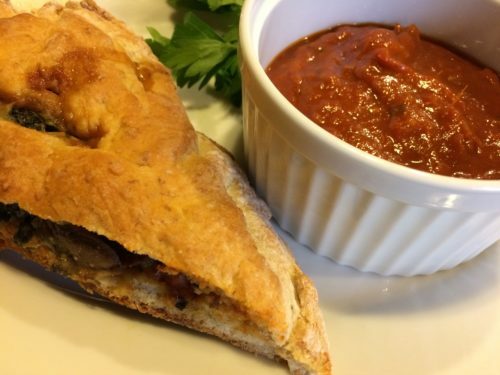 The calzone is sometimes served with a spicy tomato sauce for dipping. 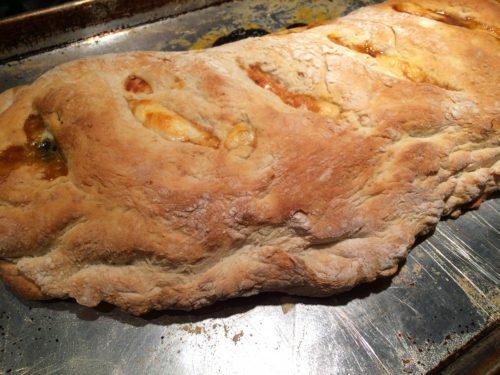 And one of the key ingredients for a “traditional calzone” is ricotta cheese. We also ordered double crust pizzas which were basically one pizza baked on top of another pizza in a pan. There were just a few pizza shops that made the double crust pizzas in our college town. 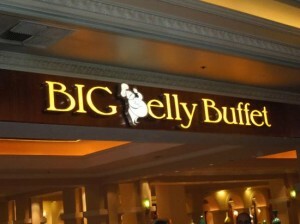 My favorite is the calzone. It’s best sliced and dipped into my homemade roasted tomato sauce. You can use your favorite pizza sauce if you don’t want to make my roasted tomato sauce. 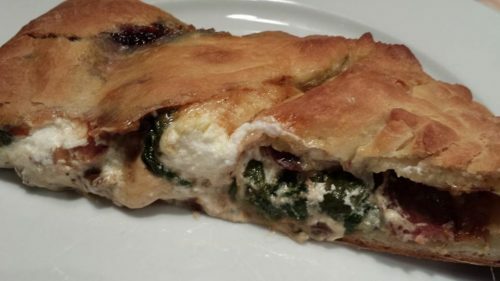 I like to stuff my calzones with ricotta cheese, shredded mozzarella cheese, sausage, sauteed cremini mushrooms, sauteed spinach, and garlic. Making a calzone is pretty simple. 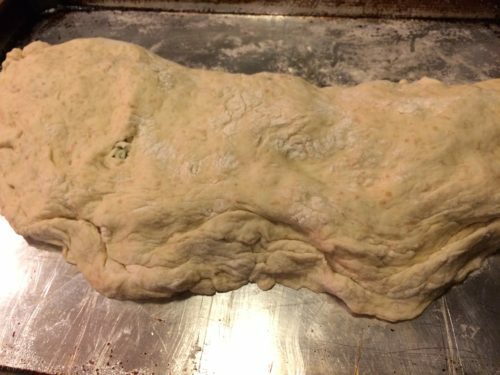 Start with pre-made pizza dough. 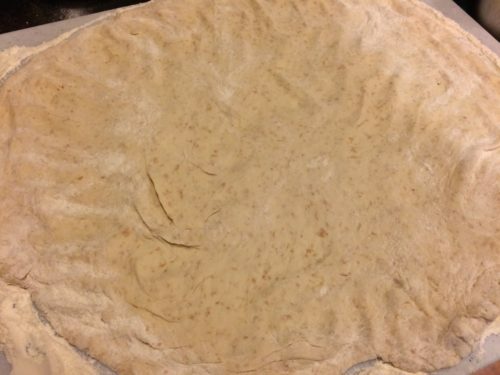 You can make your own, use my recipe for Easy Pizza Dough, or you can purchase pre-made dough at your local bakery or grocery store. Slice some Italian flavored sausage. 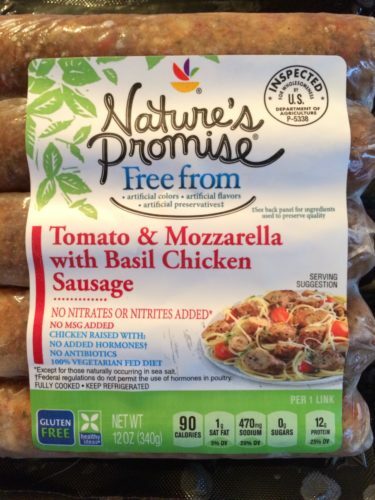 I like to use Nature’s Promise Tomato and Mozzarella with Basil chicken sausages. 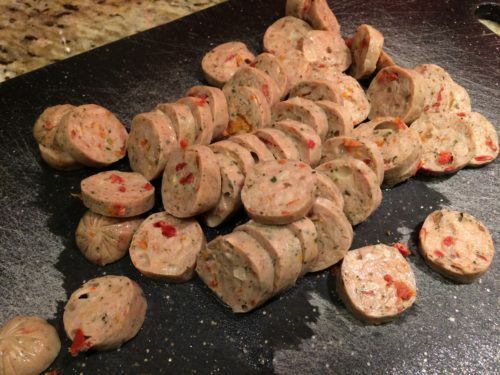 I use three sausage links for this recipe. 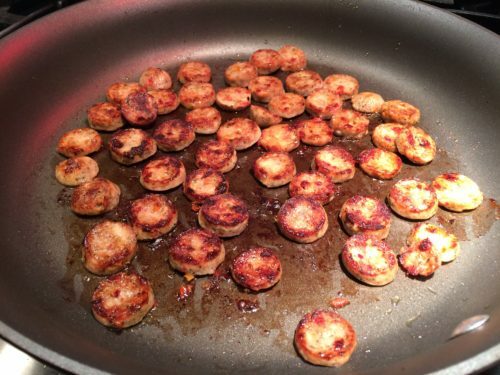 Saute the sausage slices on both sides in some olive oil over medium low heat until browned. In the same pan, saute some sliced mushrooms until they are soft. Just move the sausage slices to one side of the pan. Then add some fresh spinach leaves and some minced garlic. You can use fresh minced garlic or Dorot frozen garlic cubes. 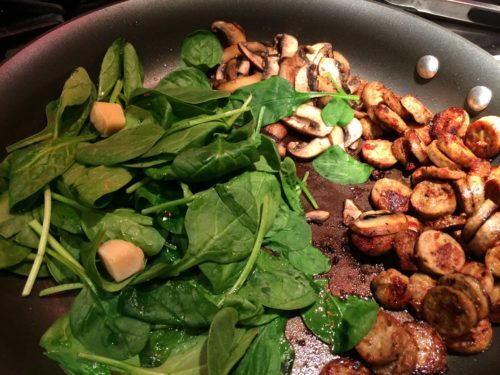 When the spinach has wilted, remove the skillet from the heat and set aside. Roll out the pizza dough onto a greased sheet pan. Form the dough into a circular shape. 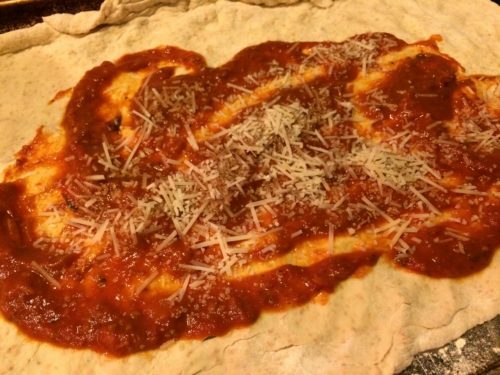 Spread some roasted tomato sauce or pizza sauce onto the dough. Spread some sauce onto the dough. Sprinkle some shredded Parmesan cheese onto the sauce. Sprinkle some shredded mozzarella cheese and add a few dollops of ricotta cheese over the Parmesan. 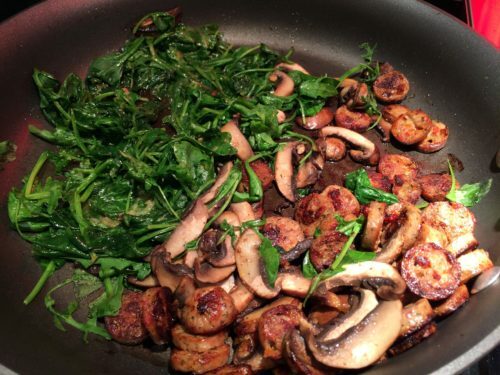 Add the sausage slices, mushrooms, wilted spinach and garlic on top of the cheeses. Add some additional roasted tomato sauce. Fold the dough half over the filling half being careful not to pull the filling with it. 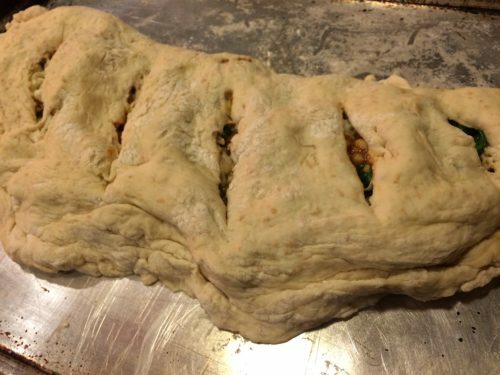 Seal the edges with your fingers by crimping the dough together so the filling doesn’t ooze out. Cut a few slits into the top of the filling. 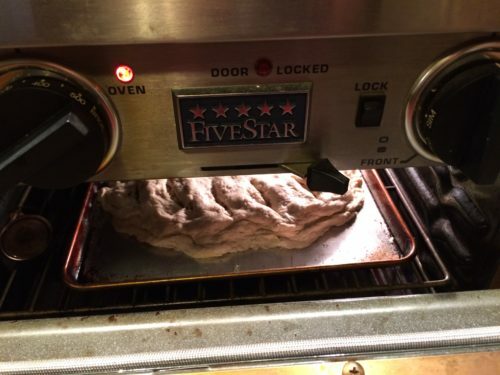 Bake the calzone in the oven until golden brown and the filling is bubbling. 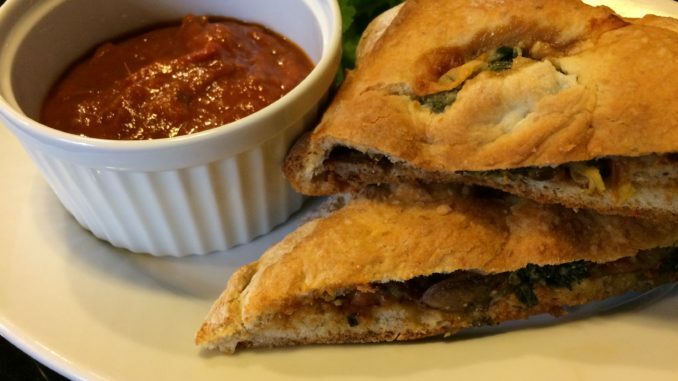 Serve a slice (or two) of calzone with some warmed roasted tomato sauce for dipping. Use more ricotta if you like a gooier calzone. 1. Meat Lovers Calzone: Pepperoni, sausage, salami, ricotta, mozzarella, pizza sauce. Slice and dip into warm pizza sauce. 2. Veggie Calzone: Bell pepper, mushroom, black olive, sliced tomato, sauteed spinach, ricotta, mozzarella, oregano, basil, pizza sauce. Slice and dip into warm pizza sauce. 3. 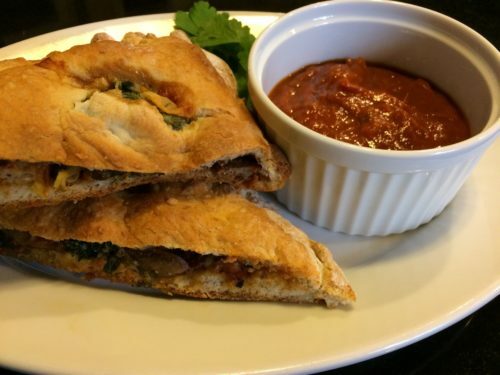 BBQ Chicken Calzone: Roasted chicken chunks, smoked gouda, thinly sliced purple onion, mozzarella, BBQ sauce. Slice and dip into warm BBQ sauce. 4. 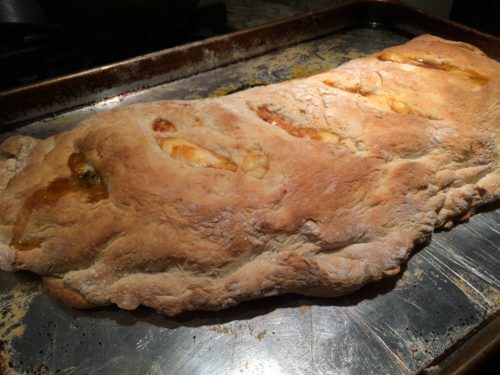 White Calzone: Mozzarella, ricotta, goat cheese, garlic, oregano, melted butter. Slice and dip into melted butter. 5. Meatball Calzone: Meatballs, ricotta, mozzarella, oregano, pizza sauce. Slice and dip into warm pizza sauce. 6. 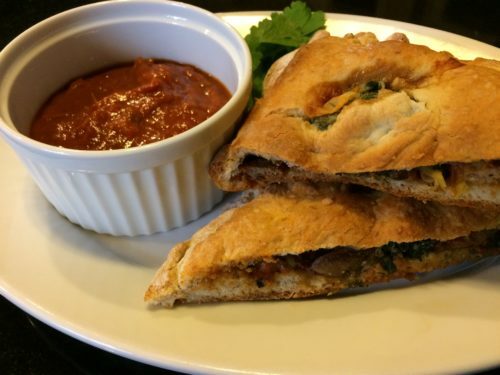 Tex Mex Calzone: Taco-seasoned ground beef, cheddar, Monterey Jack, diced tomato, scallions, refried beans, taco sauce. 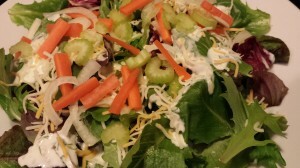 Slice and dip into my chilled Creamy Chipotle Cream Dressing or your favorite salsa. 7. Philly Cheese Steak Calzone: Thinly sliced cooked beef steak, sauteed onions and bell peppers, Cheez Whiz sauce. Slice and dip into warm beef broth. 8. Margherita Calzone: Sliced tomatoes, mozzarella, ricotta, garlic, basil. Slice and dip into warm pizza sauce. 9. Apple Pie Dessert Calzone: Sweetened ricotta, cinnamon, apple pie filling. Slice and top with chilled whipped cream. 3. 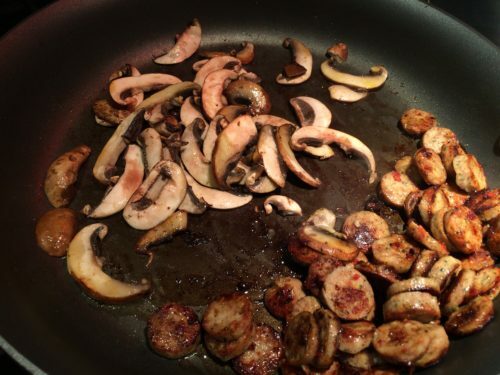 When the sausage slices are browned on both sides, move the sausage to the side of the pan and saute the mushrooms. 4. When the mushrooms are soft, add the spinach and the garlic. Put the lid on the pan and saute until the spinach wilts. Remove the skillet from the heat and leave the lid on. 5. Roll out the pizza dough onto a large greased sheet pan and shape into a circular form. 6. Ladle half a cup of roasted tomato sauce onto the pizza dough. Sprinkle on the Parmesan leaving about two inches from the edges of the dough uncovered. 7. Add the shredded mozzarella and the ricotta or goat cheese in dollops on top of the sauce. 8. 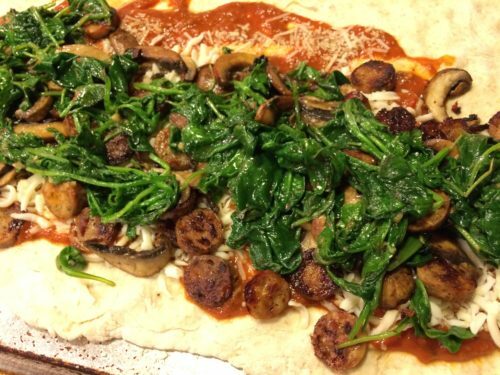 Spread the sausage, mushroom, and spinach over the cheeses. 9. Drizzle a bit more sauce over the filling. 10. Fold the plain side of the dough over the filled half to make a half moon shape being careful not to pull the filling over the edges. 11. 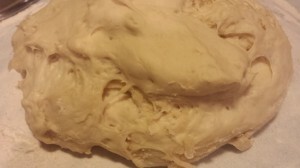 Seal the dough by pinching around the edges with your fingers. 12. With a sharp knife, make a few slits in the top of the calzone. 13. Put the calzone into the oven and bake until the top is golden brown and you can see the filling bubbling a bit. Check at 15 minutes and continue baking until done. 14. While the calzone is baking, warm the rest of the roasted tomato sauce for serving. 15. 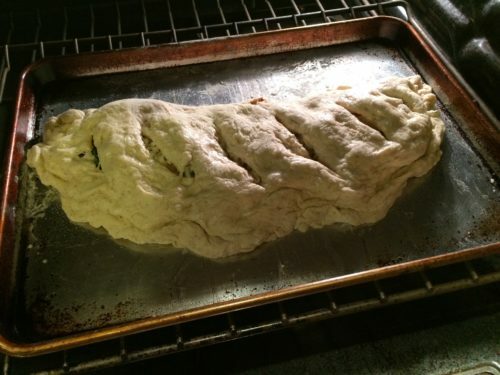 Remove the calzone from the oven and let it sit a few minutes before slicing. 16. Plate the calzone slices and serve with the warmed roasted tomato sauce for dipping. Serves 4 – 6 hungry diners. Offer with additional roasted tomato sauce for dipping. My Tomato Cucumber Salad with Peppered Goat Cheese is a tasty accompaniment. 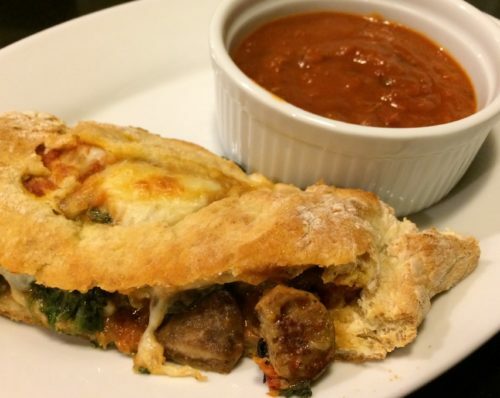 Soda, beer or dry red wine pair nicely with this Sausage Spinach Mushroom Calzone. Variations: See my “ideas for calzones” list above.